Please come and join us at the next McClendon Scholar in Residence program at the New York Avenue Presbyterian Church. 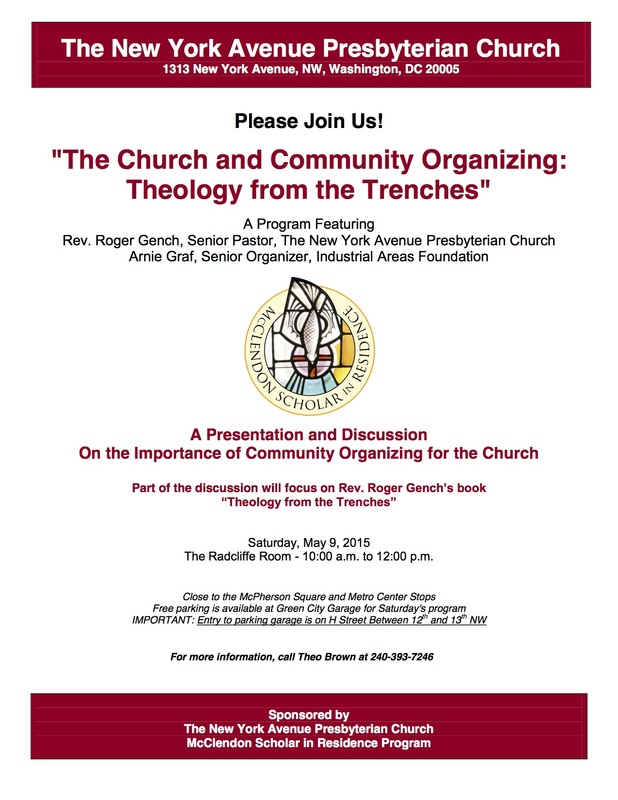 On Saturday, May 9th, from 10 AM to 12 noon, Arnie Graf, Senior Organizer of the Industrial Areas Foundation, and the Reverend Roger Gench, Senior Pastor of the New York Avenue Presbyterian Church, will discuss “The Church and Community Organizing: Theology from the Trenches.” Mr. Graf is a legendary community organizer with the Industrial Areas Foundation, founded by Saul Alinsky in Chicago. The Washington Inter-Faith Network [WIN] is the IAF affiliate here in Washington. Dr. Gench has recently authored “Theology from the Trenches” which recounts the lessons he has drawn from his experiences as a pastor of urban churches in Baltimore and Washington and as a leader of IAF affiliates in both cities. Both speakers will grapple with how faith and social action interact through community organizing. The event will take place at the New York Avenue Presbyterian Church. Free parking is available at Green City Parking on H St. between 12th and 13th, NW. See the flyer for the event below.